Retired NFL quarterback Jake Plummer was one of the first people to see it, and he got to see it firsthand. In the offseason after Plummer led the Denver Broncos to the 2005 AFC Championship game, then-Broncos head coach Mike Shanahan traded up in the 2006 NFL Draft to select Jay Cutler with the 11th overall selection. The move was puzzling to many and infuriating to Plummer. With a front row seat at practice and in meeting rooms, Plummer watched a flashy young quarterback with a million-dollar arm and a 10-cent head take his job as the starting quarterback for the Denver Broncos. Cutler’s raw athletic talent was obvious from day one. Aside from having arguably the strongest arm in the league as a rookie, Cutler showed off above average athleticism at the 2006 NFL Combine, running a 4.77 forty-yard dash and cranking out 23 reps of 225 pounds on the bench press — meaning he was faster than some running backs and stronger than some offensive linemen. From a physical attributes standpoint, Cutler was a can’t-miss prospect. 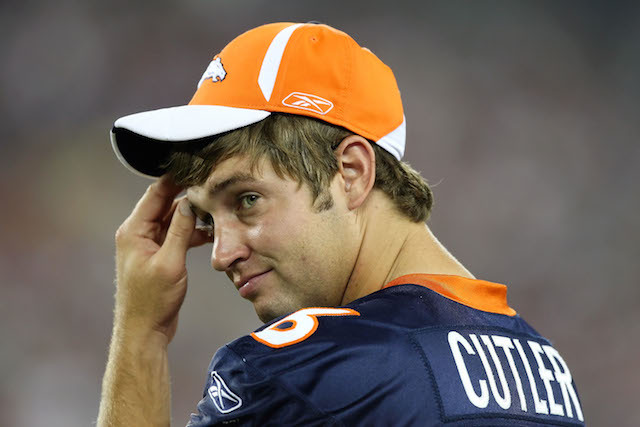 After dazzling Shanahan and the Broncos’ coaching staff during training camp and the preseason with his arm strength, speculation grew with every passing week as to when Cutler would take over as starting quarterback for the Denver Broncos. All statistics courtesy of Pro-Football-Reference.com. Despite a 7-4 start, Cutler replaced Plummer as the Broncos’ starter for their Week 13 game against the Seattle Seahawks. In his rookie season, Cutler went 2-3 as a starter flashing signs of brilliance mixed with several head-scratching decisions on the field. As it turns out, his brief body of work as a rookie was a very accurate indicator of what was to come for the quarterback out of Vanderbilt. Cutler has a career record of 62-59, good for a .512 career-winning percentage. 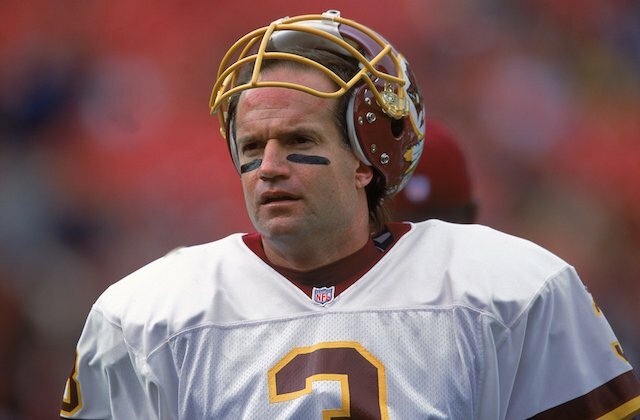 He has thrown 183 career touchdown passes to 130 career interceptions, a 1.40:1 ratio. In his seven full seasons as a starter, he has reached the playoffs once, going 1-1 in 2010. 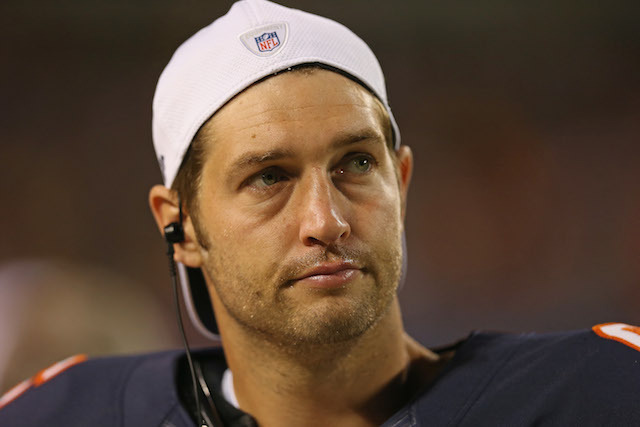 Cutler has always played just well enough and flashed just enough potential to get the hopes up of everyone in Chicago, Bears executives included. Any coach in the NFL will tell you that when it comes to quarterbacks, leadership qualities are not far behind physical ability in determining long-term success at the position at the game’s highest level. This is an area where Cutler is among the worst, if not the absolute worst, in the league dating back to 2008 when he blamed the defense for the Broncos’ 52-21 Week 17 loss to the San Diego Chargers. In his defense, only those who have played with him and been in the locker room with him truly know how Cutler performs as leader. With that being said, it is really hard to envision a guy with his sideline demeanor, constant scowl, and overall I-don’t-give-a-damn attitude being a championship caliber leader. This past Sunday was another prime example. Following the Chicago Bears’ Week 7 home loss to the Miami Dolphins, Cutler and wide receiver Brandon Marshall could be overheard yelling at each other in the Bears’ locker room, something that has yet to happen with Peyton Manning, Tom Brady, or Drew Brees and their respective star wide receivers. As you can see, the two rocket armed quarterbacks have had uncannily similar statistics throughout their NFL careers. On top of that, both players let their egos get the best of them when they were with the teams that originally drafted them and were traded away despite their enormous amounts of potential. Both players had their best seasons — statistically speaking — in years where their teams missed the playoffs. Both players have clashed with numerous coaches. Both players are (were, in George’s case) gunslingers who may be overly confident in their arm-strength. Last but not least, both guys have personalities that make them very unlikeable. It’s starting to look more and more like Jake Plummer was spot-on with his initial assertion.